While one is bringing down rare pieces of fabricsa��bagh, phulkari and sainchi embroidery collected by art and textile connoisseur C L Bharanya��the other is returning to the city with traditional Parsi Gara embroidery in a new form. Hosted by the Crafts Council of India in celebration of its 50 years of existence, Delhi-based textile art historian, Dr Jasleen Dhamija, and Ahmedabad-based Ashdeen Lilaowala, voted last year by Elle as the hottest design talent, will be showcasing pieces and giving talks at Amethyst. On Monday evening, Dhamija will introduce us to the origins, philosophy and romance of Phulkari embroidery through her talk. She will also be sharing pieces from her private collection, and Bharanya��s museum pieces, made by women in Punjab and Haryana. a�?Ita��s a private collection for people to just see and learn,a�? says Dhamija. Till November 29. Meanwhile, Lilaowala who has lots to offer says, a�?Ia��m bringing more of oranges and reds this time in mulberry silk and tussar.a�? 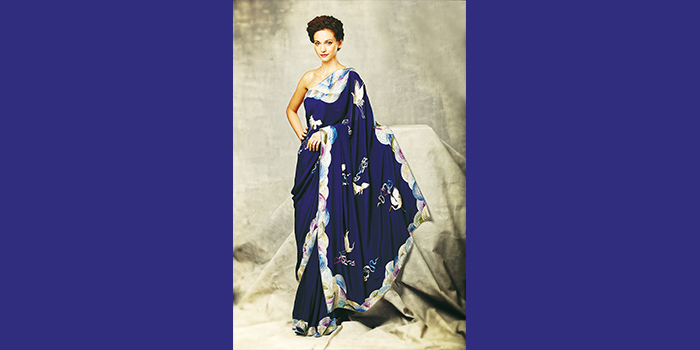 At Amethyst on November 25, he promises saris and dresses with floral Chantilly lace and Mandarin collars, frog closures and beaded fringes, featuring chrysanthemums and peacocks made with a modern take on Parsi Gara, which were showcased at Lakme Fashion Week this year. Whata��s new are potli bags that hea��s introduced just for Chennai, and bandhini dupattas featuring Parsi Gara. Lilaowalaa��s favourite is a black and red crepe evening sari with cranes on it.